Vuly knows best that these fun-filled play centres are for people of any age, and they’re popping up just about everywhere! Indoor and outdoor parks have emerged in Australia, Europe and in parts of the US. There’s even one in a giant cave in North Wales! Bounce Below is the world’s largest underground trampoline and it’s recently been set up in an abandoned slate mine. The only catch is ... the highest trampoline is suspended 180 feet above the cave floor!! It may be darker and scarier than usual, but it’s anything but gloomy and the company that operates it says there’s nothing to worry about. Bouncers are given helmets and jumpsuits and can jump on three massive trampolines at different levels, linked by a long tunnel slide! 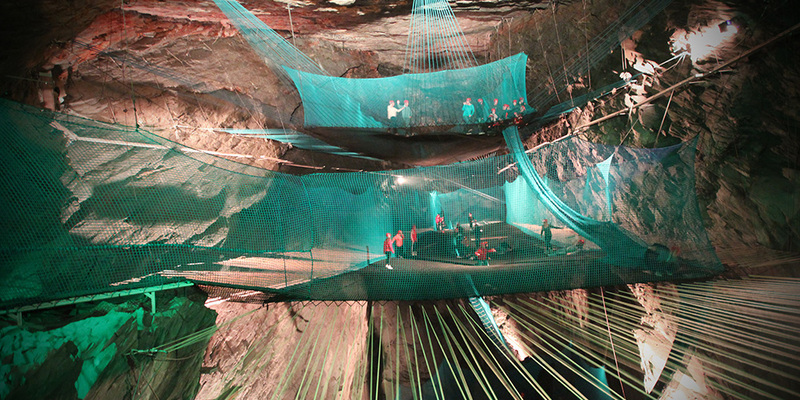 The cave where this unique trampoline park can be found measures over 60 metres long and is 35 metres high! In colder climates, there is a tendency to build trampoline parks indoors as an alternative to staying at home in front of the TV with the heater on max. But this underground adventure can be experienced all year round at the same temperature (about 8°C). You’ll warm up pretty soon when the blood and adrenaline start pumping! While it may be scorching hot in Australia during summer, many people in the Northern Hemisphere can get the winter blues. So what better way is there than subterranean trampolining to help you stay fit and active during the colder months? If you happen to be in North Wales and are looking for something thrilling and active to do, Bounce Below will cost you about $36 AU. However, it’s not for the faint-hearted, so whatever you do... don’t look down! There’s a clear resurgence in the popularity of trampolines and many are jumping at the opportunity to get fit in a fun way. We see bouncing around with your buddies as a very healthy one. In fact, our trampolines are featured at Sky Zone, an indoor trampoline park that has locations all over Australia and the world. While they don’t have their trampolines in a giant cave, the company’s motto is all about getting couch potatoes active and jumping instead of sitting at home playing video games. Remember, don’t do a flip next to someone as you may find your foot coming into contact with his or her head. In terms of fitness, you won’t know how many calories you’re burning just by bouncing around for 10 minutes... it’s equivalent to 30 minutes of jogging! What a workout! Check out www.skyzone.com.au for the closest trampoline park to you.